Besides being addicted to live music, I also have a few non-musical guilty pleasures that I’m addicted to. One of which is watching the A&E show Storage Wars, and similar shows like the History Channel’s Pawn Stars. And I’d like to start a new Live Fix experiment about finding concert treasures in our garages and other buried places in our lives by sharing a couple snippets from each show where concert posters and concert fan treasured item was involved. During the new episode of Storage Wars called Unclaimed Baggage, Dave Hester “The Mongol” is challenged to a bidding dual with his estranged brother. Dave wins and thinks he has paid too much for the locker but then he finds something special. As he is going through the locker, Dave uncovers a bundle of rare concert posters from the Fillmore featuring The Grateful Dead, Clearwater Credence Revival and others who played the San Francisco scene in the late sixties and early seventies. It was also great to watch the show because Dave turned to our friends and sponsors at Wolfgang’s Vault to have the posters looked at to determine their historical and estimated value. 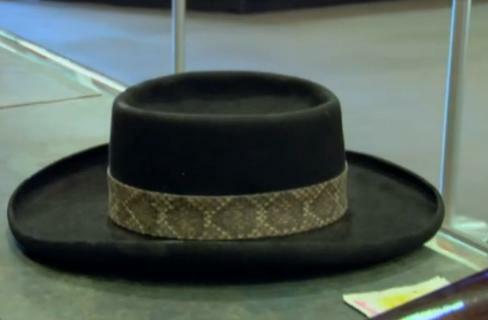 Then as I was watching a the “Out of Gas” episode of Pawn Stars, one customer brings in a custom-made hat the Ronnie Van Zant of Lynyrd Skynyrd wore during shows. And the fans explains the hat was given to him during a rare and expected backstage meeting with one of Van Zant’s roadies. So I’ve been thinking about these two great concert memorabilia stories and I’d love to hear about yours. What sort of exciting discoveries you’ve made over the years or recently in your home, or anywhere else? What’s the most amazing and interesting concert relic or memory piece that you’ve discovered, or lost and then found again? And what was it about that concert relic that made it so special for you? What’s the story behind it? Thanks again for following along and I look forward to hearing and sharing your stories and exploring this topic more on a future episode of Live Fix Radio. Get your story straight. The guy said Ronnie put it on his hat at the end of the concert and a roadie slapped a backstage pass on his chest and that he went and mingled for a while.